Ise Grand Shrine is a Shinto shrine dedicated to goddess Amaterasu-ōmikami, located in the city of Ise in Mie prefecture, Japan. Officially known simply as Jingū, Ise Jingū is in fact a shrine complex composed of a large number of Shinto shrines centered on two main shrines, Naikū and Gekū. The Inner Shrine, Naikū (also officially known as “Kotai Jingū”), is located in the town of Uji-tachi, south of central Ise City, and is dedicated to the worship of Amaterasu-ōmikami. The Outer Shrine, Gekū (also officially known as “Toyouke Daijingu”), is located about six kilometers from Naikū and dedicated to Toyouke no ōmikami, the deity of agriculture and industry. Besides Naikū and Gekū, there are an additional 123 Shinto shrines in Ise City and the surrounding areas, 91 of them connected to Naikū and 32 to Gekū. Purportedly the home of the Sacred Mirror, the shrine is one of Shinto’s holiest and most important sites. Access to both sites is strictly limited, with the common public allowed to see little more than the thatched roofs of the central structures, hidden behind four tall wooden fences. The chief priest or priestess of Ise Shrine must come from the Japanese imperial family and is responsible for watching over the Shrine. The two main shrines of Ise are joined by a pilgrimage road that passes through the old entertainment district of Furuichi. The region around the shrines consists of the Ise-Shima National Park and numerous other holy and historic sites including the “wedded rocks” (Meoto Iwa), and the Saiku (the site of the Heian period imperial residence). According to the Nihon Shoki, around 2,000 years ago the divine Yamatohime-no-mikoto, daughter of the Emperor Suinin, set out from Mt. Miwa in modern Nara Prefecture in search of a permanent location to worship the goddess Amaterasu-ōmikami, wandering for 20 years through the regions of Ohmi and Mino. Her search eventually brought her to Ise, in modern Mie Prefecture, where she is said to have established Naikū after hearing the voice of Amaterasu-ōmikami saying “(Ise) is a secluded and pleasant land. In this land I wish to dwell.” Before Yamatohime-no-mikoto’s journey, Amaterasu-ōmikami had been worshiped at the imperial residence in Yamato, then briefly at Kasanui in the eastern Nara basin. Besides the traditional establishment date of 4 B.C.E., other dates of the 3rd and 5th centuries have been put forward for the establishment of Naikū and Gekū respectively. The first shrine building at Naikū was erected by Emperor Temmu (678-686), with the first ceremonial rebuilding being carried out by his wife, Empress Jito, in 692. The shrine was foremost among a group of shrines which became objects of imperial patronage in the early Heian period. In 965, Emperor Murakami ordered imperial messengers to be sent to report important events to the guardian kami of Japan. These heihaku were initially presented to 16 shrines including the Ise Shrine. From the late 7th century until the 14th century, the role of chief priestess of Ise Shrine was carried out by a female member of the Japanese imperial family, known as a Saiō. According to the Man’yōshū, The Anthology of Ten Thousand Leaves, the first Saiō to serve at the shrine was princess Okunohime-miko, daughter of Emperor Temmu, during the Asuka period of Japanese history. Mention of Ise Shrine’s Saiō is also made in the Aoi, Sakaki and Yugao chapters of The Tale of Genji, as well as in the 69th chapter of The Tales of Ise (Ise Monogatari). The Saiō system ended during the turmoil of the Nambokucho Period. During the Empire of Japan period, and the establishment of State Shinto, the position of chief priest of the Ise Shrine was fulfilled by the reigning Emperor, and Emperors Meiji, Taisho and Showa all played the role of chief priest during their reigns. Since the disestablishment of State Shinto during the Occupation of Japan, the offices of chief priest and most sacred priestess have been held by former members of the imperial family or their descendants. The current chief priest of the shrine is Takatsukasa Naotake, adoptive son of Takatsukasa Kazuko. He succeeded Kitashirakawa Michihisa, a great-grandson of the Meiji Emperor, in 2007. Kitashirakawa Michihisa succeeded his cousin Kuni Kuniaki, the eldest son of former Prince Kuni Asaakira (brother of Empress Kōjun), in 2001. Kitashirakawa’s grandmother, Kitashirakawa Fusako, the seventh daughter of the Meiji Emperor, served as most sacred priestess of the Ise Shrine from 1947 until her death in 1974. She was succeeded in that post by Takatsukasa Kazuko, the third daughter of the Shōwa Emperor, who held the post until ill health forced her retirement in 1988. Takatsukasa was succeeded by her younger sister, Ikeda Atsuko. The architectural style of the Ise shrine is known as shinmei-zukuri, characterized by extreme simplicity and antiquity: its basic principles date back to the Kofun era (250-538 C.E.). The shrine buildings use a special variant of this style called Yuitsu-shinmei-zukuri (唯一神明造? ), which may not be used in the construction of any other shrine. The old shrines are dismantled and new ones built on an adjacent site to exacting specifications every 20 years at exorbitant expense, so that the buildings will be forever new and forever ancient and original. The present buildings, dating from 2013, are the 62nd iteration to date and are scheduled for rebuilding in 2033. The shrine at Naikū is constructed of Japanese cypress. Built on pillars set directly in the ground, the shrine building measures 10.9 by 5.5 meters and includes a raised floor, verandahs all the way around the building and a staircase leading to a single central doorway. The roof is made of thatched reed with ten billets (katsuogi) located on the ridge of the roof, the bargeboards of which project beyond the roof to form the distinctive forked finials (chigi) at the ends of the ridge. The roof ridge is supported by two free-standing columns called the munamochi-bashira. The katsuogi, chigi and munamochi-bashira are stylised forms of older storehouse building techniques that pre-date the introduction of Buddhist architecture in Japan. The empty site beside the shrine building, the site where the previous shrine once stood and where the next will be built, is called the kodenchi. This area is strewn with large white pebbles and is left totally empty apart from the oi-ya, a small wooden hut containing a wooden pole a little over 2 metres in height called the shin-no-mihashira (new sacred central pole). When a new shrine is built, it is built around the sacred central pole before the removal of the oi-ya, so that the central pole is never seen. The central pole of the old shrine will then have a new oi-ya erected so that the shin-no-mihashira also remains unseen. The erection of a single post in the center of a sacred area strewn with stones represents the form taken by Japanese places of worship in very ancient times; the shin-no-mihashira would thus be the survival of a symbolism from a very primitive symbolism to the present day. The shrine buildings at Naikū and Gekū, as well as the Uji Bridge, are rebuilt every 20 years as a part of the Shinto belief of the death and renewal of nature and the impermanence of all things — wabi-sabi — and as a way of passing building techniques from one generation to the next. The twenty year renewal process is called the Sengu. In August, in a long-standing tradition the people who live in Ise are allowed to enter the area around the Inner Sanctum of the Naiku as well as the Geku. Some villages drag a wooden carriage laden with white stones up the Izuzu river onto the grounds of the Naiku. Each participant gets two white stones in a white handkerchief and these allow them to place the stones in the area around the Inner Sanctum. Other villages drag a huge wooden car or Noburi Kuruma laden with white stones to the Uji bridge at the entrance of the grounds of the Naiku. Participants receive two white stones which are also placed in the sacred space around the Inner Sanctum. The entire tradition is called Shiraisshiki and it is very colourful with every participant wearing a ‘happi’ coat representing a particular village. The rebuilding of the main shrine takes place on an adjacent site next to the old, and each rebuilding alternates between the two sites. The next scheduled rebuilding of Naikū is due in 2033 on the lower, northern site. In the lead-up to the rebuilding of the shrines, a number of festivals are held to mark special events. The Okihiki Festival is held in the spring over two consecutive years and involves people from surrounding towns dragging huge wooden logs through the streets of Ise to Naikū and Gekū. In the lead-up to the 2013 rebuilding, the Okihiki festival was held in 2006 and 2007. A year after the completion of the Okihiki festival, carpenters begin preparing the wood for its eventual use in the Shrine. From the late 7th century, when the festivals and offerings of Ise Shrine became more formalised, a number of annual events have been performed at both Naikū and Gekū. The Tsukinamisai, which was held in June and December, as well as the Kannamesai in September, were the only three offerings performed by the Saio, an imperial princess who served as high priestess of the shrine until the 14th century. These offerings are based on the cycle of the agricultural year and are still performed today. The first important ceremony of the modern calendar year is the Kinensai, where prayers are offered for a bountiful harvest. Kannamesai, where prayers for fair weather and sufficient rains are made, is held twice a year in May and August at both Naikū and Gekū. The most important annual festival held at Ise Shrine is the Kannamesai Festival 神嘗祭. Held in October each year, this ritual makes offerings of the first harvest of crops for the season to Amaterasu-ōmikami.An imperial envoy carries the offering of rice harvested by the Emperor himself to Ise, as well as five-coloured silk cloth and other materials, called heihaku. Besides the agricultural ceremonies already mentioned, ceremonies and festivals are held throughout the year at both Naikū and Gekū to celebrate such things as the new year, the foundation of Japan, past emperors, purification rituals for priests and court musicians, good sake fermentation and for the Emperor’s birthday. There are also daily food offerings to the shrine kami held both in the mornings and evenings. This 100 meter wooden bridge, built in a traditional Japanese style, stretches across the Isuzu river at the entrance of Naikū. Like the shrine buildings of Naikū, it is rebuilt every 20 years as a part of the Shikinen Sengū ceremony. On crossing the bridge, the path turns to the right along the banks of the Isuzu river and passes through large landscaped gardens. After crossing a short, wide bridge, pilgrims to the shrine encounter the Temizusha, a small, roofed structure containing a pool of water for use in ritual purification. Visitors are encouraged to wash their hands and rinse their mouths at Temizusha as a symbolic act to clean the mind and body of impurity. The first of two large torii gates stands just beyond the Temizusha. After passing the first large torii gate, the Purification Hall (Saikan), and the hall for visitors from the imperial household (Anzaisho) is located to the left. The Saikan is used by shrine priests to purify themselves before performing ceremonies at the shrine. They are required to spend one or two nights to free their minds of worldly issues, partaking in baths and eating meals cooked with the sacred fire. This hall for special prayer, located just after the second large torii gate, is open to the public for the offering of individual prayers to the kami, the giving of donations and the purchase of special talisman of protection, amulets and hanging scrolls of Amaterasu Omikami. This hall contains the sacred fire used to cook all of the food offerings to the kami of Ise Shrine. Rice and other offerings cooked on the sacred fire are stored in a box made of Japanese cypress, then purified at the Haraedo immediately in front of the Imibiyaden before being offered to the kami. The pilgrimage path then approaches the main shrine of Naikū by a set of large stone steps. Visitors are supposed to keep to the sides of the path as the middle is set aside for the goddess Amaterasu-ōmikami. Etiquette is the same as for most Shinto shrines. Though the actual shrine is hidden behind a large fence, pilgrims can approach the gate to offer their prayers. Photographs in this area are prohibited and this restriction is strictly policed. Kotaijingu is said to hold the Sacred Mirror, one of three sacred items given to the first emperor by the gods. From a path that follows the line of the outer wall, the distinctive roof of the shrine building can be seen through the trees. In front of the walled shrine compound can be seen an open area which will be the location of the next rebuilding of the shrine in 2013. 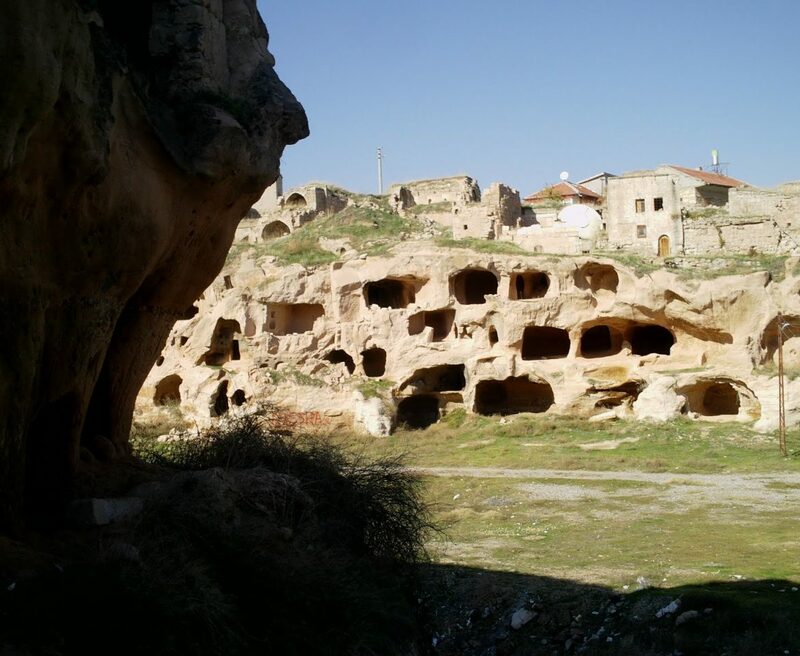 Özkonak Underground City is an ancient city built on the northern slopes of Mt. Idis about 14 km northeast of Avanos in Turkey.